Taking the approach that experience is the best teacher, Large Scale Incident Management is the first book of its kind to use a major, real-life, contemporary event to teach key incident management concepts. The book places readers in the Incident Commander seat for the EQ chemical fires that occurred in Apex, North Carolina, in October 2006: an event that lasted three days, shut down an entire city, and displaced 17,000 citizens. Using this large-scale incident as a running example of how critical components of successful incident management are actually applied in real life, it provides detailed insight into important topics in the field. Coverage begins with pre-planning and preparation, emergency plan development, and conducting community hazard assessments, and then progresses to implementation of the National Incident Management System (NIMS) as a part of daily operations, incident action plans, and complex NIMS for large catastrophic events. 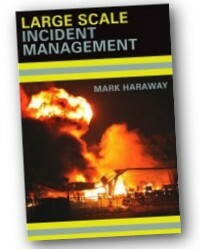 With this unique, real-life approach, the book is both engaging and instructional, leaving readers with a solid understanding, not only of large scale incident management concepts, but also how to apply them. Mark Haraway holds a Bachelor of Science degree in Fire Safety Management and is the Fire Chief in the Town of Apex located in Apex, North Carolina. 240 Pages - 6 x 9 in.